Ludwig's Breakbeats 4-piece shell pack is perfect. 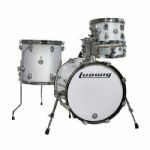 Ludwig actually brought in the famous Roots drummer Questlove to help them create a compact set of drums that travel wonderfully and still pack more than enough punch to fill out the backbeat when you're playing tight clubs. With hardwood shells, Remo Pinstripe heads, and ingenious hardware, you'll feel right at home behind this set. Top it off with an included set of velvet gig bags, and you're ready to grab your Breakbeats drums and go.